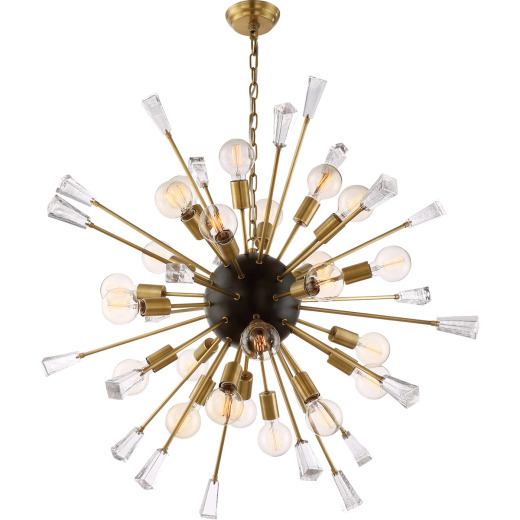 This unique and chic chandelier features aged brass and matte black or polished nickel with sparkling crystals and glass. The Muse chandelier pairs orbital bulbs and glistening crystals glass to create an intricate fixture. This stunning chandelier will make an artistic and stylish impression in your home. Available in three sizes, it is versatile for many spots of your home or office. Features three sizes with 24, 18 or 12 lights with medium base bulbs, 60W. Available in aged brass or polished nickel.